I had thought that i would done with Latvia for a bit, but a friend of mine said she liked the mitten designs. so i thought i would do one more. I will certainly return to Latvia, because much is left to say, but i feel the need to cover a different subject. 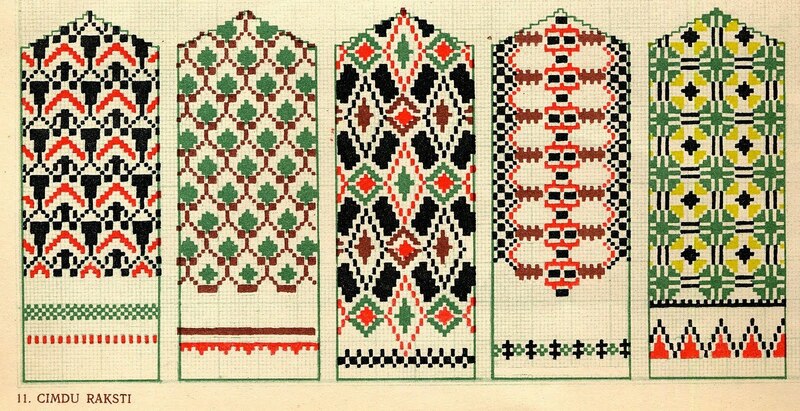 In the Soviet Era, one thing that was encouraged was the development of the folk applied arts, including developing and modernizing them for inclusion into modern society. 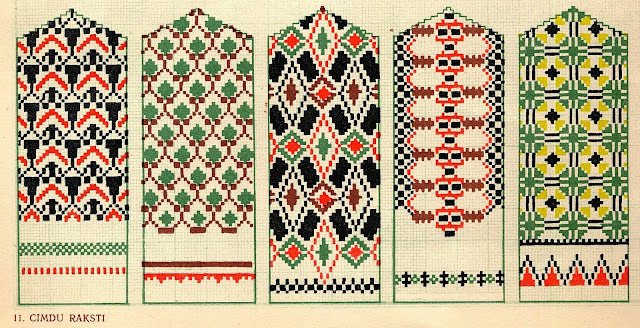 Handicrafts were greatly appreciated and the desire was to use them as a nonpolitical basis for pride in ones ethnicity. 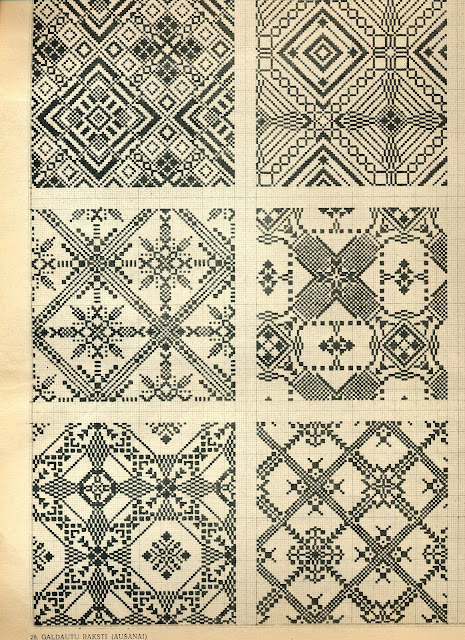 Most publications about the traditional applied arts included a section on how they were being used contemporaneously. 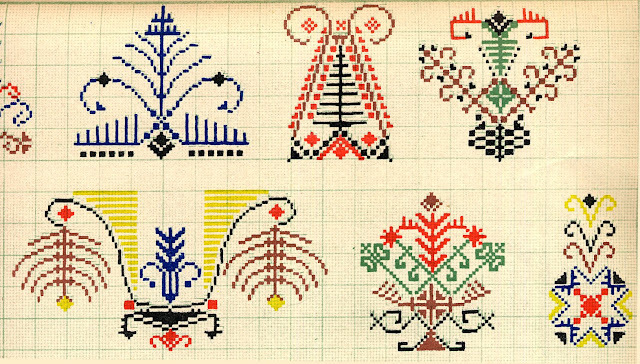 Today i will be presenting some designs by the artist Ž. Ventaskrasts. I know very little about this artist. I had the opportunity to scan a book which belongs to my Latgalian friend Aelita. 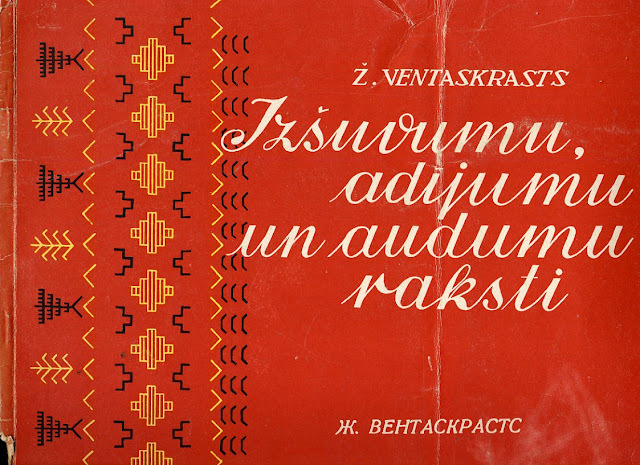 There is a very minimal text in Latvian, and thankfully also in Russian, [which i CAN read]. 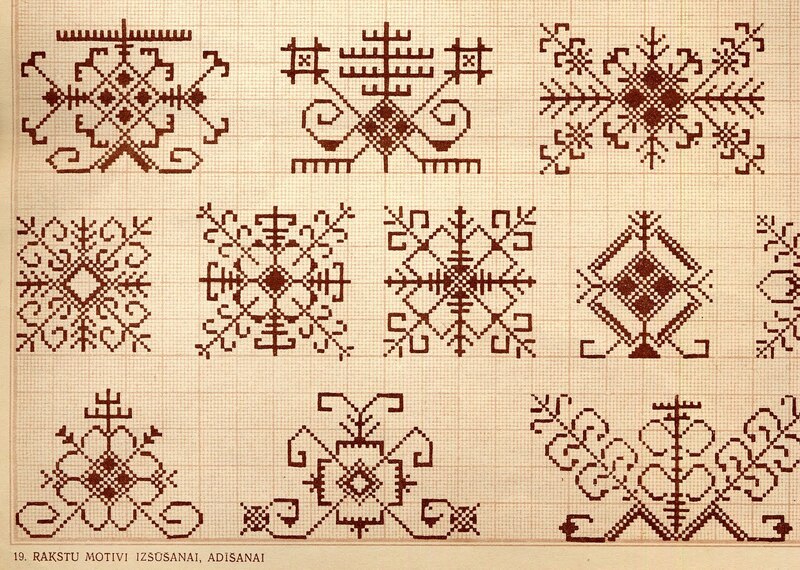 The artist presents his opinion that the applied folk arts should be developed in accordance with the times. And so this book was published, which took Latvian applied folk art designs, and developed them. Here is the cover of the book. The title of the work translates as 'Designs for embroidery, knitting and weaving' The book was published in 1958. 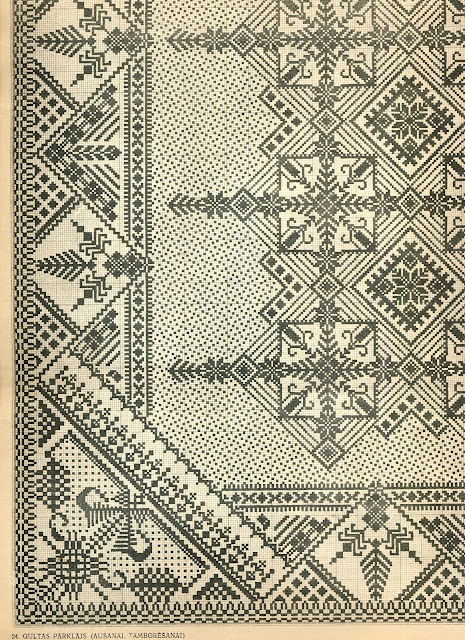 So the designs are traditional Latvian designs reinterpreted according to the applied art fashions of the day. Today they look almost as 1950's as they do Latvian. 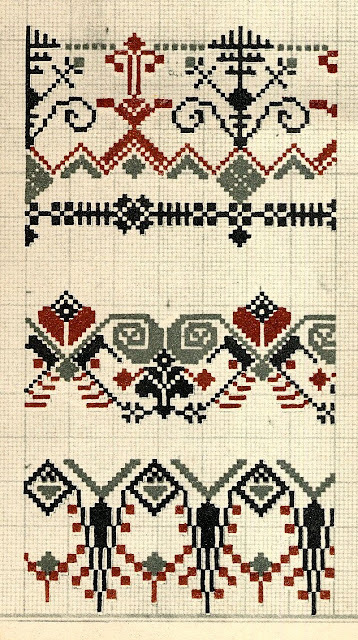 I cannot present all of the designs, as there are far too many, but i will present a selection. 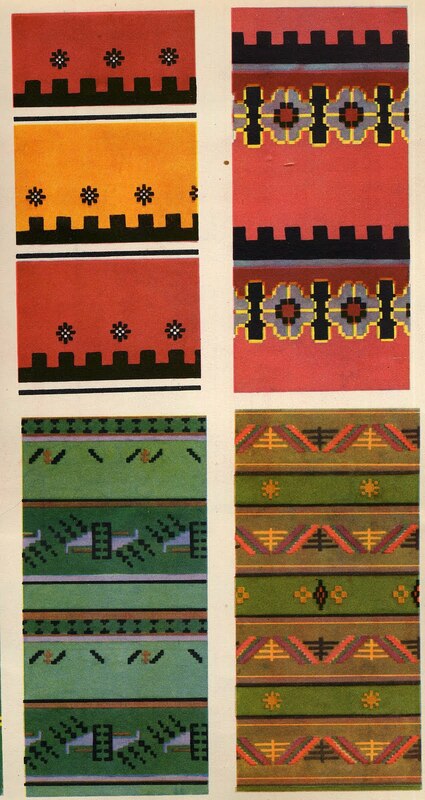 Multicolor area designs with a white background. 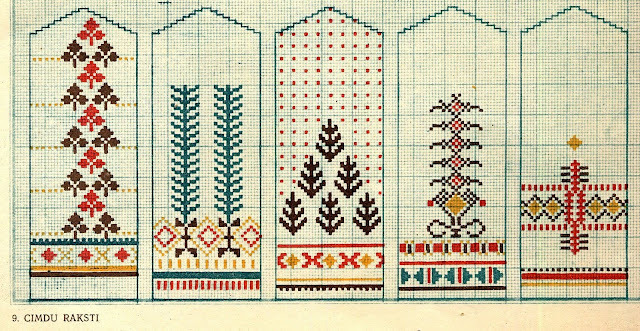 Designs on a colored background, better for knitting. 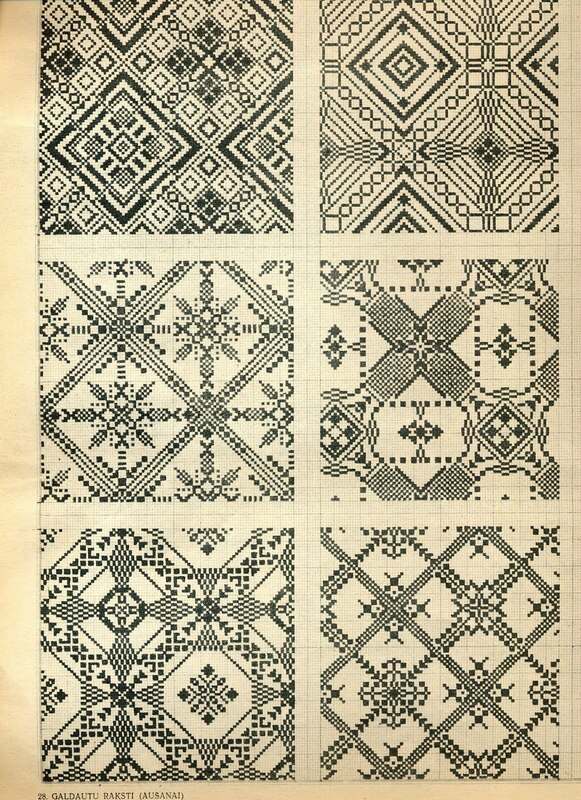 Designs for coverlets, best for weaving, athough they could be knitted. 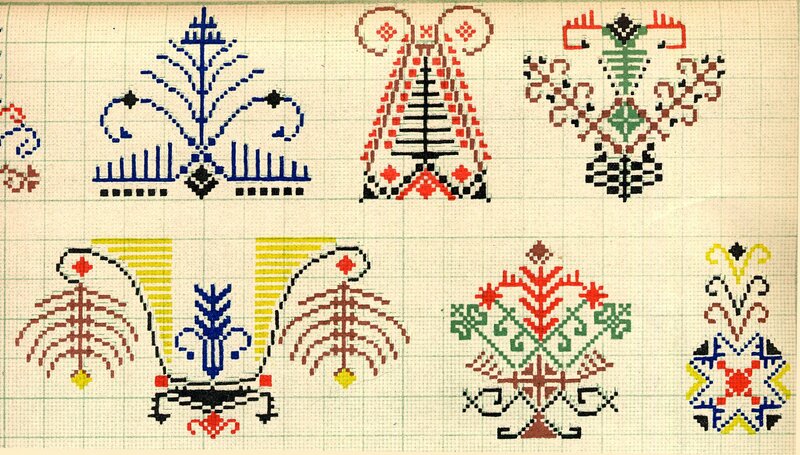 So this is an overview of the designs developed by this artist from the Folk Art of Latvia. I hope that this has interested and possibly inspired you. Please note that none of my postings are intended to be an exhaustive covering of a particular subject. 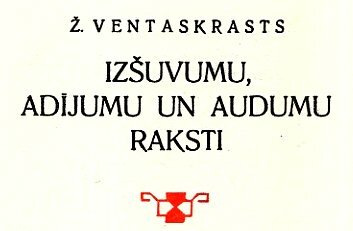 Ž. VentasKrasti is my grandfather. How wonderful for you to be from such an artistic family. One question, what does the Z stand for? and is this person a man or a woman? I will try this again. I enjoyed this research very much. 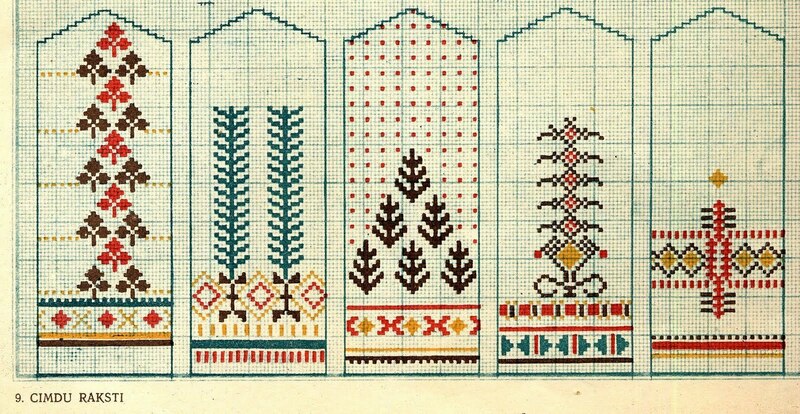 Do you have any designs for the weaving of bands?